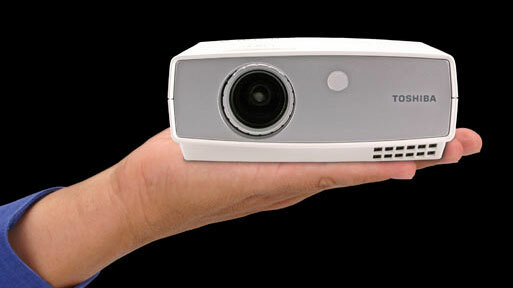 Toshiba's palm-sized DLP projector packs a 800x600 pixel punch, and unlike other experimental mini-projectors of its ilk, this one's fo' reals. Accentuating its portability, the company made it so that it will run on batteries for a couple of hours, and it even pumps audio through an onboard speaker for a completely self-contained guerrilla theater. Two hours? Hey, that's just long enough to watch a movie on its included 23-inch foldout screen. Our pal Peter Pachal at Sci-Fi Tech laid his eyes on this $700 baby, and calls its brightness and color "decent," even when viewed on a bright tradeshow floor. Sounds perfect for the next time you get stuck in an elevator—plug in your iPod and screen a few episodes of Six Feet Under while you wait to be rescued.